The very colorful festival of Holi will be celebrated on 11th March all over India. 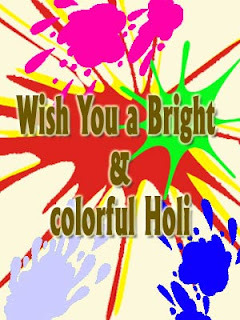 It is a festival of colors, joy, love, happiness and spirit. Colors are the most important part of the festival as all the people get together and throw colors on each other. On the day of Holi the entire atmosphere gets filled with colors everywhere and is a beautiful sight to behold. People forget their differences and come together in friendship to color each other. There is love and joy in the air and sounds of the Dholak that beats in the background. People sing songs of holi in loud voices and force the whole neighborhood to join in the celebrations. The women folk in the house would have prepared special sweets like the gujiya, Gazaks and "drinks" like the "Bhang" or the very popular "Thandai" which is enjoyed as refreshments by all the guests who visit their houses. This festival of colors is very popular among children and they eagerly wait to play with their color filled "pichkaris" or water pistols, water balloons etc that they can throw on an unsuspecting passerby. Oh what fun it is, I remember, playing holi as a kid. It is not only the kids who come out to play, but people of all ages, young and old. Holi is a festival where you can just let your hair down and let loose with no restrictions and have lots of fun. People move out in groups called "tolis" and visit all the houses in the neighborhood to color each and every person forcing them out of their homes, even the shy ones, no one is spared. So, hey if you are thinking of hiding at home, this Holi, don't think you will be spared! Ideally the festival of Holi celebrates the arrival of spring and the colors used in Holi reflect the various hues of spring. But, unfortunately the colors that are being used in this festival may be toxic chemical substances that may harm you. Therefore to avoid an environmental degradation and to help de-pollute Holi several environmentalist are urging people to celebrate Holi with eco-friendly colors. These colors are prepared from natural sources and do not cause and harmful side effects. 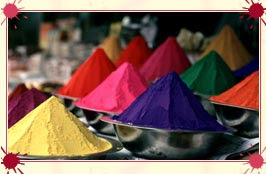 Need to know more about how to prepare Natural Colors of Holi then visit this site: http://www.thecolorsofindia.com/natural-colors/index.html and learn how all the colors can be easily prepared at home. Also see some delicious special Holi recipes that you can prepare at home and keep ready for your guests tomorrow here: http://www.thecolorsofindia.com/recipes/index.html. Wish all the readers a very "Happy Holi" and hope that you all have lots of fun playing with "natural" colors.